Lots of new information out there recently on what is actually influencing the aromas and flavours in your wine. Used to be just mainly the grape variety, the place where those grapes were grown and the winemaking. No longer. 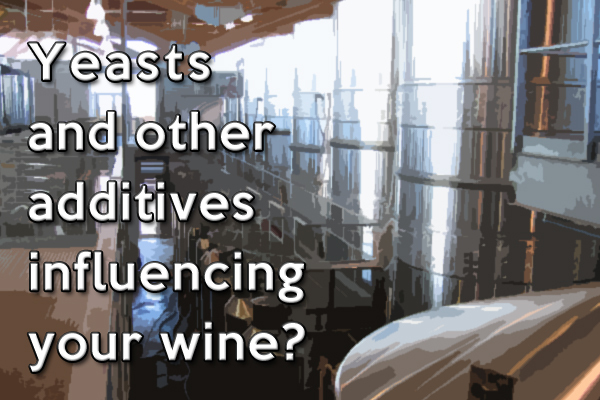 Allegations abound as to which of many possible additives are being used by various wineries. Lack of the ingredient labeling usually found on packaged food is becoming a problem for the wine consumer. Really admire what some wineries like Ridge & Bonny Doon are doing to raise awareness of this problem. Excellent article on August 19, 2014 by John Tilson in the Underground Wine Letter “Caution! What’s In Your Wine?” Yeasts are another important influence on your smell and taste sensations. Benjamin Lewin MW on August 1, 2014 in Decanter presents a thought provoking analysis of “Yeasts: Do You Know What’s Flavouring Your Wine?” Specialized cultured yeasts have been developed to enhance specific aromas and flavours from the grapes. To what extent is debatable because clones and canopy management can also be important factors. However if you “want your chardonnay to taste more like Meursault … use Lalvin CY3079 yeast , which increases the impression of hazelnuts and brioche, and mouthfeel.” “Reduce pyrazine quantity or perception of cabernet sauvignon herbaceous character in the glass by using Enoferm CSM.” Using just the native or indigenous yeast let’s nature take its usual course. I am against manipulation. I am a strong advocate for wanting as much information and disclosure as possible so I know what is in my wine and what is influencing those aromas and taste flavours I am experiencing! What about you? Are you concerned? Do you want more information? Are you concerned about what is in your wine? Yes, I have a right to know.